Goals and Objectives Describe the learning outcomes and/or goals. 1. Students will have a basic knowledge of the circumstances surrounding the writing of our National Anthem. 2. Students will be able to communicate a response (verbal, written or otherwise) to the question: why is it important to preserve things of historical significance? 3. Students will be able to communicate a response (verbal, written, visual, musical or otherwise) to the questions: How has The Star-Spangled Banner been a source of unity? How has it been a source of controversy? How does it represent our national identity? Description: This Prezi presentation and included Teacher’s Guide are intended to be used with students in all subject areas as a classroom ready source for learning about the origins and meaning of our National Anthem. Click here for printable teacher’s guide. Activities Follow the link to the Prezi Presentation and use the Teacher’s Guide to lead students through the presentation. 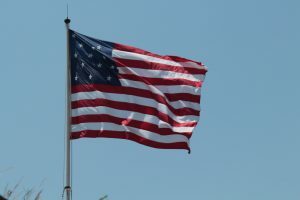 The Teacher’s Guide presents interesting facts to inform and pique student interest about the events leading to the writing of our National Anthem. Thought provoking questions, vocabulary, images and sounds are all included in this presentation. Please check out all the resources available at www.starspangledmusic.org !!!! Can you be considered a patriot while opposing your country’s actions? Can you think of any act of opposition that can be considered patriot? What could be some reasons that the large 42′ X 30′ flag was not flying during the battle? it was storming during the 25 hour bombardment and the flag would have weighed over 400 lbs. wet…the wooden flag pole could not have supported it! Describe what you see in this painting. Do you think this could be an accurate portrayal of the story of how The Star Spangled Banner came to be written? What does this painting make you wonder? Bubble #4. (Facts and Myths) This is a picture of the original “Broadside” printing of the poem. A Broadside was a “poster” of sorts, distributed and posted around town to give citizens news or information during this time period. What could have been the goal for changing the title when printing it as a song? To market it to a larger audience, not just Baltimoreans. To sell more music! Read through the description at the top of the page and then call attention to the other 3 verses. A paraphrase or analysis of these verses could be inserted here in the lesson. Why would recycling tunes (melodies) be an effective way to create a new song in the early 1800s? Literacy was less common……many people did not read, especially music! It was a tune everyone already knew so it was quickly learned. There were over 40 documented songs using this same tune prior to Francis Scott Key’s lyric. Gentleman’s Clubs were popular social organizations in the 18th and 19th century. These clubs were made up of upper class men who would gather to socialize, attend concerts, eat a meal and sing together. This song was a signature song of the Anacreon Gentleman’s Club and was intended to show off the accomplished voice of one of it’s members, and then joined in on the chorus by the entire club membership. Click to focus on the visual and listen to a performance. Why was this a significant victory for the Americans? The Americans were very discouraged after the British burned Washington DC…….it was uplifting to have this victory! Our navel forces were made up of only 16 ships, whereas the British Navy had over 1,000 ships and was considered the most powerful navy in the world at that time. This was a case of the “underdog” Americans coming out on top! 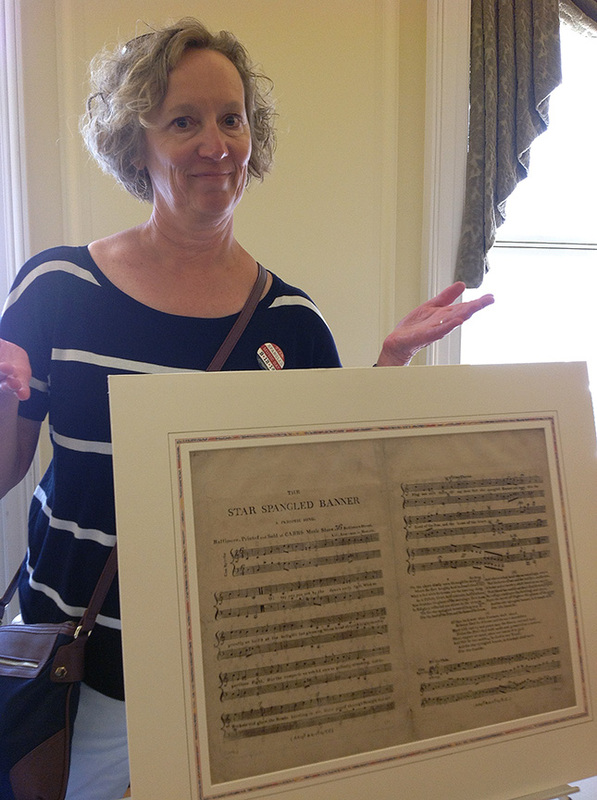 Click to focus on Francis Scott Key’s original document and to listen to a performance. Bubble #7. (Facts and Myths) LOC refers to The Library of Congress who paid a half a million dollars for this copy of a first edition. Why do you think it was printed hastily (quickly)? To “ride the wave” of the patriotic fervor following the victory and to sell more music! What makes a historical document such as this so valuable? The National Anthem has become a ritual at sporting events. What do you do when you hear the anthem being sung or played? Stand, hand over heart, face the music, sing! What is the significance of these behaviors? These behaviors are a show of respect. Why do you think it took so long (117 years) for The Star Spangled Banner to become our National Anthem? National Anthems were not a common thing during the 19th century. There were many controversies over a standard version and the song was difficult to sing……described as a very “athletic” melody. Click to move on to the large bubble containing the video of the story Students should view the story with discussion to follow as necessary. Click to move on to the large bubble containing the highlighted vocabulary from the text of the first verse. Students can reread the lyrics, substituting words with the same meaning for greater understanding. Ask students to paraphrase this first verse in one sentence or question. Is the flag still there? Invite students to participate! They may stand with hand over heart facing the flag, or simply sing with a focus on the words. Either way…..have fun! Questions for review: responses can be verbal, visual (such as drawing a picture), writing prompt for a written paragraph or otherwise. How does singing the National Anthem make you feel? Why? What does our National Anthem mean to you? What does it mean to our country? Standards North Carolina Music Standards: 7.CR.1.1 Understand the relationship to the geography, history and culture of modern societies from the emergence of the First Global Age to the present. 7.CR.1.2. Understand the relationships between music and concepts from other areas. 7.CR.1.3. Understand global, interdisciplinary and 21st century connections with music. 7.CR.1.3. Understand the functions music serves, roles of musicians and conditions under which music is typically written and performed. 8.CR.1.1. Understand the role of music in North Carolina and the United States in relation to history and geography. 8.CR.1.2. Understand the relationships between music and concepts from other areas. This entry was posted in Education, Teaching Ideas. Bookmark the permalink.